You know how I promised you the Cinnamon Raisin Bread and Cinnamon Sugar Bread recipe this week? Well, um, I thought I had tweaked the recipe and worked out the perfect combination of ingredients. However, when I went to make a final batch to make sure it worked correctly, I made a serious mistake: I forgot to put the paddles in the bread machine! So I ran the whole dough cycle without any paddles. Which, ahem, is a rather pointless exercise. When I finally discovered my mistake, it was too late in the day to run another dough cycle and bake the bread, so I just let the ingredients sit until the morning. In the morning, I tried to run the dough cycle again, this time with the paddles in. Only (you’re not going to believe this! ), one of the paddles wasn’t in all the way, so only half the dough got mixed up. Determined not to waste the ingredients, I ran the dough through yet another short cycle. It rose and rolled out normally and baked into a beautiful loaf. But the looks of this beautiful loaf were very deceiving, because when I cut into it, I found a practically hollow loaf. The girls and I ate the bread, regardless of the mishaps, and it was still quite good. But I thought the filling needed a little more tweaking and, obviously, I need to get my brain cells connected better so I can make dough correctly. I promise I’ll experiment some more over the next few days and hopefully be able to present a delicious and near-perfect Cinnamon Raisin and Cinnamon Sugar Bread recipe next week. Hopefully! Just cut into slices and make french toast. Tonight while making cookies I forgot to put the brown sugar in. I did that the other day – I was going to make cinnamon rolls and forgot the paddle – I happened to check it 5 minutes after I start and couldn’t quite figure out why the flour wasn’t moving. I ended up digging in with my hand and ultimately caused the paddle to fuse on to the post. At least the rolls tasted good. So I feel your pain!! LOL. Hi, I was wondering what bread machine you have? Thanks much. Our bread machine just died and I was looking for a new one. This one looks really nice. I think the double paddles would really make a difference. I have the zojirushi as well and think it is worth every penny. It has worked for me for over 10 years! It’s super cold in Texas this week and we’re having rolling black outs, so I couldn’t get my bread to rise! I tried putting it near the fire place to give it some heat… but no dice. So bummed! Put just the yeast, water (make sure it’s warm or hot!) and sugar in the bowl, and let it sit for 10 minutes or until the yeast is reacting. It’s cold here in Ohio too, and I made bread yesterday for a church meeting. This gets the bacteria in the yeast reacting (it loves the sugar! ), and will give your bread a head-start in the reaction process. If the house is too cold still, either set the bowl on a heating vent, or pre-heat the oven/stove to 250-300 and set the bowl on it. You can also microwave a bowl of water for a minute or two and then put the bread in there to rise with the door closed. I do this with my bagels when I make them! okay, I am a total bread making failure, I swear! I dont have a bread machine ( I used to and never had good results) but I have a kitchenaid mixer. I look forward to seeing this recipe and the final loaf. I got some four and yeast from King Arthur Flour and had my first successful loaf in YEARS! thanks for letting me know I am not the only one who has bread issues! I am the same way. I got a bread machine about 5 years ago and I have never had bread turn out using it. Not even if I take it out and bake it myself. 🙁 But my Kitchenaid stand mixer is a blessing along with my William-Sonomia Baking cookbook. I have made cinnamon rolls, wheat bread, dinner rolls, etc., and they have all turned out beautifully. The recipe for white bread in the book that comes with the Kitchen Aid mixer is easy and fool proof. It comes out perfect every time I make it. thanks! I still have the book that came with it so I will look and see! Glad to know I’m not the only one with kitchen mishaps! About a week ago, my bread making ended abruptly with a small kitchen fire…. It took me until today to get the courage to make bread again (even though I’ve been baking our bread for several years with no other mishaps!). I even made cinnamon-raisin bread, and posted about it on my blog. Maybe the bread didn’t turn out right but it still looks really good! Crystal, you’re in VERY GOOD COMPANY!!! I attempted to make banana bread a couple days ago; got things mixed together and baking for 20 minutes before I realized I forgot to add the BANANA. I whipped it out of the oven and added a banana “glaze” to my already half-baked bread. You are not alone in a baking mishap this week. I made snickerdoodle muffins and forgot to put the eggs in! We ate them anyway, and my kids had a good laugh. They couldn’t wait for Daddy to get home, so they could tell him what I did! The muffins sound good. Do you have a recipe you could share? I’ve really got to get a bread maker, I was going to ask you which one you use, but just saw the link above. Crystal, I can’t wait to show my hubby this post. He thinks he’s the only one that has to eat less-than-perfect food. These types of recipe “modifications” are a norm at my house. But we laugh and power on. Thanks for sharing a little giggle. Been there. done that. 😉 It happens to the best of us. Cube it up and make bread pudding! No one with ever know it wasn’t pretty when you sliced into it. I have had the same thing happened once or twice before, but I make all of my bread by hand (no bread machine here). I need to try & get some dough to rise today, but living in an older drafty house is challenging when it comes to bread baking in the winter time. Good luck with your next attempt, I look forward to the recipe! Just when I thought I couldn’t like you more! It’s amazing how absolutely encouraging failure posts are! Thank you! Can’t wait for the final receipe. If you don’t have a kitchenaid mixer or bread machine, don’t let that discourage you guys. You can always, ahem, knead it yourself, with your muscles/arms/hands. 🙂 I do have a kitchenaid but there is something about kneading bread I love — poor kitchenaid hasn’t been used in 5 yrs and it’s brand new! Crystal will have a good recipe, I’m sure, but google will provide you some options if you can’t wait to start kneading! Oh my! I thank you for your humility in sharing that. It really helps me as I am really learning how to be frugal, and do lots of things in the kitchen, from blogs to know that “it happens” to the best of us! thanks for the laugh! I bet it still tasted good! what kind of loaf pan do you use in the oven? This is awesome! You mean you are actually ….human?? lol….the pic made my mouth water, so it cant be that bad…. I always see you talking about making your own bread. About how much per loaf does it cost to make? I’m assuming it’s more economical than paying the $1-3 per loaf. Are there recipes to make white whole grain breads? When life hands you lemons – make lemonade. When life hands you hollow cinnamon sugar bread – make bread pudding! If you have any leftover bits and pieces of your cinnamon bread, I’d grate into breadcrumbs to sprinkle on the applesauce you make. Warm the applesauce a little. The cinnamon sugar would make it taste like apple pie. You could sprinkle it on yogurt or pudding as well. The beautiful picture last week of your cinnamon bread inspired us, and on one of our “snow” days this week, we made dough. Great dough, in fact. Rolled it out, cinnamon, sugar, raisins, and rolled it up. We put it into our microwave to raise, because its a warm closed container. Then we forgot about it, until the following morning when I opened the microwave door to put in some water for hot chocolate. UGH! Just wanted to let you know you’re not the only one with bread failures this week! I don’t have a bread machine, so I blame all my failures on me! I’m glad you didn’t throw it away – I was going to tell you that it would probably make yummy bread pudding! Yeah, I think we’ve all had the experiences of running it without the paddle or without the paddle fastened properly. The saddest thing is when it bakes like that and you have to throw the whole thing out. Now I’m a little worried, I left instructions with the hubby to put on a batch of pizza dough in the bread machine for dinner tonight! Um, I have forgotten to put the paddles in my bread machine numerous times! Except I always catch it, because i check to see how things are mixing after about 5 minutes (ingredients tend to stick to the sides in my machine) and then I have to put it in the goop of ingredients. But it usually ends up ok. So sorry for your mishap! I have totally done that before – both forgetting the paddles completely, and also not pushing the paddle down far enough. 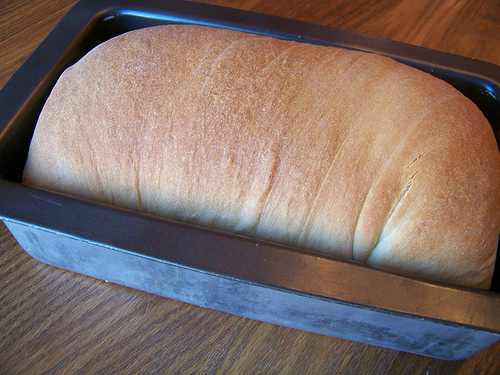 AND I’ll go one farther: when I first got my bread machine, I was also scared to be forceful in pushing the pan down into it’s base, and “made” my first bread without it mixing at all because the pan wasn’t connected properly. So sad. Stuff it with cream cheese filling and make it a king cake! I waited all week to make banana bread loaves. I let the bananas get good and ripe knowing I would get the most flavor that way. I finally put it all together and baked them. When I pulled them out they were flat and dense and then I realized that I completely forgot the baking powder! Lol. I didn’t want to waste all 7 mini loaves so I cut them into cubes, rolled them in butter, spread them out on a cookie sheet, topped them with a cinnamon crumb topping and them served them as a breakfast with hot syrup drizzled over them. It was like banana bread and pancakes all in. Lol. Not too bad for a mistake! how funny! Thought I agree with everyone else, it would probably make good bread pudding. Saw a recipe in food network the magazine for this very same bread with the raisins and all in it. For those of us that can’t wait, you might try browsing your local bookstore for the magazine and memorizing the recipe. I thought I would share that I made cinnamon raisin bread with your butterhorn recipe. Used the bread machine and it turned out really good! I am a culinary student with one semester or basic bread making under my belt and I have made this mistake by hand, without a bread machine! It think the dough was over mixed. I can try to email you some tips I learned in class…. Something’s in the air this week. I also tried to make cinnamon rolls from scratch and since I couldn’t keep my house above 63 degrees the dough wouldn’t rise. My rolls turned out hard and the filling melted out of them. I’m going to try again this weekend! I’ve had my share of flops too – usually when trying to make it too healthy 🙂 But a great way to use up flops (muffins, cookies, breads, etc) is to make them into bread pudding. Nobody notices if they’re a little soggy! You can also make a savory bread pudding – just add spices instead of the sugar and cinnamon. One time I made peanut butter cookies and forgot to put the peanut butter in. Don’t feel bad I completely ruined a double batch of zucchini-chocolate chip bread. The baby started to cry as I was mixing it up and somehow I forgot the baking powder. I ended up with two flat and hard (not to mention expsenive when you figure wasted ingrediants) bricks that were not ediable. You win some…you lose some. I’ve noticed that I just have to roll the bread rather tight to help eliminate the air pockets. Also, the more “filling” you put in, the more the dough doesn’t want to stick to itself. Just a thought? did this recipe ever get posted? I still don’t see the recipe. Where do I find it so I can print it like the others. 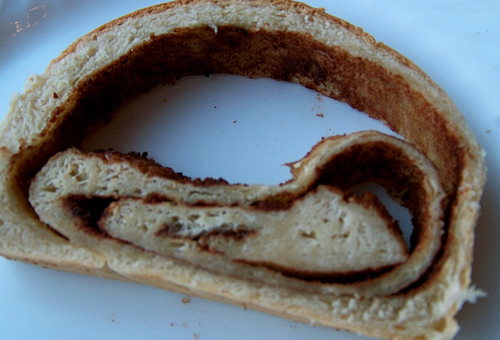 To make this without the bread machine, how much time should be needed for rising? Does it just need to rise once or twice? I’ve had luck with a plain white bread, but it’s time consuming because it has to rise two separate times. 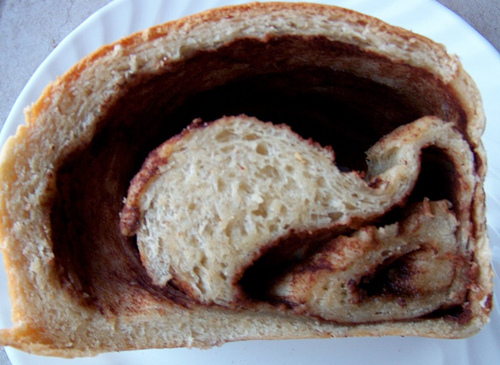 I was thinking of your post when I read in my breadmaker book that cinnamon is not a friend of yeast and that it breaks down the structure of the bread in the maker. Perhaps that was the problem! This is SOOO funny! I actually logged on here to check and see if I did anything wrong! Well, other than select “quick bread” instead of “dough”. I thought the dough looked really dry and wondered if I needed more liquid but, perhaps the higher heat, used to bake the quick bread instead of the lower heat used just to rise baked my bread instead of just rising the dough! AHHHH…. As I type this, my second dough cycle is running. I did add about a tablespoon or 2 of extra water since it looked so dry last time.